Thank you for this very detailed review of the Oculus Rift. I also hope that they’ll have a larger resolution in the consumer version. Very nice first impression, I didn’t think the developer kit would be taking over standard 3D displays. The hype kept growing though and I started to buy into it though. I am still excited about my developer kit though. You are very tech inclined and I can see the average user falling to pieces on setting up. Not to mention that even you as someone who deals with 3D on high basis felt nausea. The consumer version might be the necessary push but I still think 3D vision will be my primary focus till then. That scares me, not sure if its a limitation to reduce nausea or what. Till I heard that I wasn’t concerned about nausea, I was perfectly happy being stationary and maximizing on wide fov and great S3D when consumer version came around…. but that line scares me. One last mention, I partly blame the hype for this. When they are more readily available talk about third party support. Whether it being Virerio/ Vorpx, unless you feel its putting people on the spot. My concern is S3D rendering issues. I was kinda of skeevy about it in general because as 3D vision users we know little things can both us. Sky at wrong depth, depth of field, water at wrong depth, broken effects, etc. Now when we combine head movement and games not built around it how do we deal with it or will it be as said before reduction of settings. This is the main reason I was excited about Vorpx. He got some grift when he first announced depth buffer, but issues are minimal using it. Its probably the only way I’d imagine a wide range of support working but I’ve never actually seen content. Would love to hear your thoughts since Im probably due in Summer… or next year. Great first impressions. If I’m being honest it is making me consider cancelling my kickstarter backing before dispatch. One question I do have is have you calibrated your inter-pupillary distance in TF2 (type “vr_calibration” in console)? Another review I watched on YouTube seemed to indicate that made quite a lot of difference to the 3D stereoscopic effect. After seeing all the hype, I had big hopes for the rift. Bit after reading your review I’m back on planet Earth. Still looking forward to receive my devkit though. Maybe other people are more happy with the rift because for them S3D is new. Don’t get me wrong, the Rift is great and provides a really nice VR experience – I like it, but there are still things that need to be improved before it is ready for general use by consumers. It will be a very helpful tool for developers to get up to speed with VR programming and hopefully help in forming a community to find out what are the best practices and what to avoid when programming VR games and applications. Enthusiasts like me would probably love playing with the Rift, but for consumers it might be a bit disappointing – due to all the hype and having very high expectations, especially considering the general lack of readily available content to support it at the moment. I’ve played with IPD adjustment but that did not bring much of a difference as my IPD is 64mm as measured when checking my eyes the last time. The stereo effect is there and it works well, I’m saying it might be a bit disappointment for people that are used to playing with 3D Vision for example and cranking up the depth level to the maximum. I suppose that after a bit of getting used to the Rift I’ll have less of a problem with unnatural combined movements or visual effects leading to nausea, just like you need some time when you are new to stereoscopic 3D to get adjusted and be able to play with higher depth levels comfortably. As for converting normal games with no Rift support built-in to support the device with drivers such as the Vireio or the VorpX (still need to see something working here) things may not be as easy and as good as you might expect. Getting objects or effects rendered at wrong depth or only in one of the eyes can turn out to be a serious issue due to the large FOV that the Rift provides – it could be like trying to stick a needle in your eye. The above are just my first objective impressions, putting aside all the hype surrounding the Rift dev kits so that you can see what you should really expect. I’m sure that very soon we are going to have many people getting the dev kits bringing various mods and a lot of improvements both to further improve the experience. There are still a lot of things that need to be discovered by trial and error and need to be shared and considered, for example things regarding what is causing motion sickness and how to avoid it in the applications you make. Well, at least my expectations are now at a more realistic level. I bought the devkit just to get my fist VR experience and because I could play Doom 3 with it. Unfortunately that’s not the case. And the fact that there is no official comment on this matter worries me. I’m wondering if you can just use this thing as a large 3d monitor? Take out the head tracking etc and just use it as a huge 3d monitor where you can adjust convergence and depth. I don’t think you can. Besides, since it so low resolution, what’s the point of having a huge screen in such a low resolution? If you want wide FOV, and great 3D i’d recommend 3D vision Surround, it awesome, yet really expensive. Thanks, thats what I thought as well. Hopefully Vorpx is real or someone else will work out depth buffer because its only realistic way I see for 3rd party renderer. I preordered rift as an an enthusiast who plans to play a game every once in a while on it. Its still the same, my expectations are alot more realistic now. I would also have to say that all of my initial thoughts seem to have been confirmed by Bloody…. -have never used any head tracking that truly works for true pov control or accurate for aiming. -there is no way resolution that low could be anything but disappointing. -I know Bloody said it is not too uncomfortable, so I believe him, but wearing anything strapped to my head that weighs much more than my sunglasses for more than about 10 minutes … well, It makes my neck hurt just thinking about it. On the plus side it looks like this will be a relatively inexpensive device. Other than that I can not see it being much more than a novelty device. Just think how cheap these will be used on ebay after the consumer model has been out for a few months. Maybe the consumer version then, i just saved $300! Thanks for the review. I made the Space Station Explorer experience BTW. It only took a few hours with zero experience. I look forward to continue building my own worlds. I’ve had mine for a week and love it more as I use it more. The UDK demos are really the best. Check the developer forum. I’d like to see you update this review in a week. Rift Rush is also cool, back on Kickstarter to get the alpha. Bloody, out of curious are you worried about the future of the device as far as a 3D user? I kind of am tbh, everyone is basically feeding off of praise and its generally by VR community and people have not tried it out yet. The 3D community has taken it to be a 3D device because of its 3D design. My concern is even if it starts off as two camera viewpoint S3D device. How is it going to last, I have been to the MTBS forums and the specs of peoples computers are very poor. To the point I even doubt that they can maintain 1280X800 in 3D. They will quickly learn that high frame rate will be necessary to improve motion/ less nausea. We got into 3D as enthusiasts knowing upgrading computers constantly is needed. This was at one point I saw it as an enthusiast device. Now there is kickstarters for games and the general public wants one. Now even if 1280×800 in 3D is viable for most. When this device goes consumer at high res. Do you fear it will turn into a depth buffer/simulated 3D/ or just 2D? It’s too early to say at this stage. Keeping latency down and frame rates up becomes a tougher challenge the further you move into graphic realism. Rendering in 3D is twice as much work for your GPU, so it’s always a challenge to optimize. Abstracted games won’t put nearly the strain on systems that our game will. That being said, optimization is a big part of where we’ll be investing our time when designing levels. Hopefully, mid-range systems will be easily able to cope with things. Nice review. Thank you for posting. The resolution of the goggles – across both eyes – is 1280×800 pixels, which means each eye gets 640×800 pixels. However, because of the warping done to compensate for the optical distortion, it seems that a reasonably large portion of the display is black in the edges and that the actual image takes much fewer than 640×800 pixels. Can you estimate what percentage of the display is actually being used for the image and what portion is left black? eqzitara, I’m very optimistic about the Rift, after a year more work with a further optimized and improved consumer version it can turn out to be a great VR device with 3D support being there as a part of the experience, not the sole focus. But I don’t see the Rift being a serious alternative for traditional stereoscopic 3D gaming and competing with 3D Vision for example at least for now. The good thins is it might help game developers to bring better stereoscopic 3D support or at least integrate such in their applications if they don’t focus on only the Rift, but want to provide support for the device. The Rift will work best with games especially optimized or written for it, I don’t so even with additional software to add support for already existing games to run on the Rift I don’t expect the experience to be as good as if the game is specially developed for the device. If we get the Rift supported by 3D Vision or TriDef 3D for example this might help a lot in bringing compatibility with a lot of games, but chances of that happening are very slim. I’m also interested in seeing how good the Rift can work out for playing 3D movies and more importantly if 3D movies will be causing nausea when you get them with the “in your face” experience. 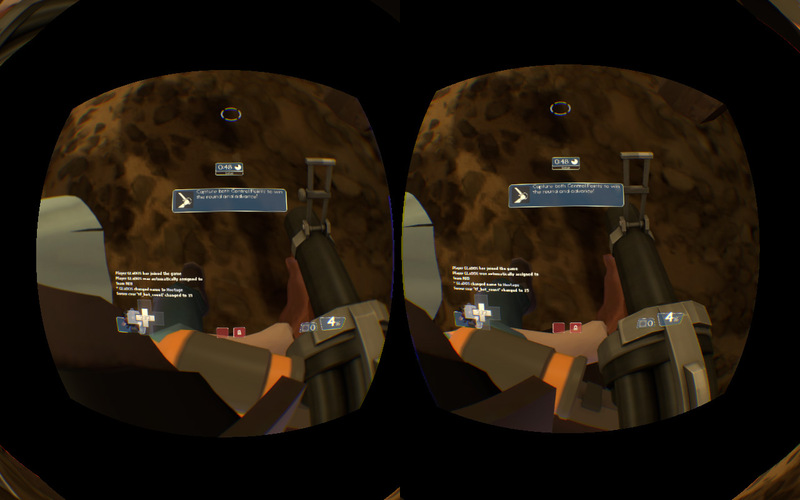 VRGuy, I’ve mentioned that above – roughly about 580×580 pixels per eye are being used in TF2 for example. Furthermore if you use the lenses for nearsighted people you get a bit more of screen estate actually not seen by the user. I wonder if the optics will show much higher resolution as a benefit. I assume straight on it will be good, but if the lens bends light like crazy on the edges, it may be so distorted in the corners that its not going to completely matter what resolution you go up to. If a boost in res really will help significantly, then we have nothing to worry about given that all these small phones are now coming out with 1920×1080 screens. This dev kit looks like its on the right track where all the other ones have not been. steve, this is actually quite easy to check. Just put on a lens from the Rift on an iPhone 4/4S display or another high pixel density screen to see, I specifically did that on a 4S, because it has a 3.5-inch screen with 326 ppi, a pixel density that can be retained if you scale the screen to 7-inch with Full HD resolution and it looks great. The lenses used in the Rift are very good and I don’t expect them to have issues with higher resolution screens. I just got my developers kit and IT BLEW ME AWAY! This is the start of something great! You feel like you are actually IN the game. It is amazing! That being said the resolution is a little low and will be upgraded in the future, however, the more time I spend with it the less I notice the low res. The Matrix is HERE!